Barry Ritholtz says the movie The Big Short gets it right. I agree with him. Canadian Couch Potato reviews Ben Carlson’s book A Wealth of Common Sense. Preet Banerjee uses this video to explain employer matching in retirement plans. Boomer and Echo say that indexers are terrible at indexing. It’s definitely true that most people who call themselves indexers invest quite actively. The Blunt Bean Counter lays out the elements of a messed up estate plan (or non-plan). Big Cajun Man is now coming up with plausible sounding names for investing strategies designed to confuse investors. I don’t think financial institutions need help with this, but maybe this post will help to make people more wary of investing strategies they don’t understand. My Own Advisor profiles a retiree with no financial worries. The main takeaway is that investing becomes a lot less important when you have a valuable pension. Million Dollar Journey looks at how taxes vary by province when trying to retire on non-eligible dividend income. I don’t get a lot of meaningful paper mail any more. It’s almost all junk mail. I thought this was the case with a Rogers’ envelope, but for some reason I opened it anyway. It turned out to be a bill for $6668.49. That got my attention. It turned out to be a bill for a Rogers Wireless account. Flipping through the pages trying to figure out what was going on, my eye was drawn to a green box telling me “You saved $0.32 on your Wireless services this bill.” I was thinking I’d better save a lot more than that. My first hope was that this was a bogus bill not sent by Rogers. But everything appeared legitimate. The web address and telephone numbers were all authentic. So, I called Rogers Wireless to see what was going on. A helpful woman named Cynthia confirmed that this really was a bill from Rogers. She then confirmed that none of the information used to set up the account matched my information except for my name and address. So, she knew this was fraud. It turned out that the account was only active for 2 days because the Rogers’ anti-fraud department had already shut the account down. But in those two days the fraudsters used about 3000 minutes on each of two phones. I certainly would have preferred it if Rogers hadn’t sent me this bill at all given they knew it wasn’t my account. The bill arrived 3 weeks after the account was shut down. My wife kept her sense of humour through this. The bogus account was a joint account in my name and someone named Maria. My wife said “So the truth finally comes out about your other wife and family.” The only part of all this that sounded good to me was that the fraudster gave a year of birth that makes me 13 years younger. I’d pay the bill if it made that true. Cynthia directed me to Rogers’ anti-fraud department to speak to Jesse who confirmed he knew the account was fraudulent. Apparently, they see this pattern a lot where bogus accounts are used for overseas calls. It turns out that the fraudsters only needed a name and address to open the account. All the other information they provided about me was wrong. It doesn’t take a sophisticated criminal to open a phone book. Jesse assured me that I’d get no more bills and that they would tell the credit agencies that this was fraud. I don’t have any immediate need to borrow, but I don’t need the credit agencies telling businesses that I’m a deadbeat. So, it appears there wasn’t much I could have done to prevent this from happening. I carefully burn all paper with sensitive information on it, but it’s hard to keep people from finding out my name and postal address. Rogers doesn’t set a very high bar for preventing identity theft. I’d prefer it if creditors were more careful giving out credit. Rogers may find it profitable to open credit accounts with no meaningful proof of identity, but the cost to me to sort this out should count for something as well. I can only imagine how much more difficult this would have been if the fraudsters had another one or two correct pieces of information about me. As usual, I’ll begin by saying I don’t offer advice. What I can do is explain how I see things and how I choose to invest myself. You should be deeply suspicious of market projections. There are smart people who offer a view of the future because they want to help investors. 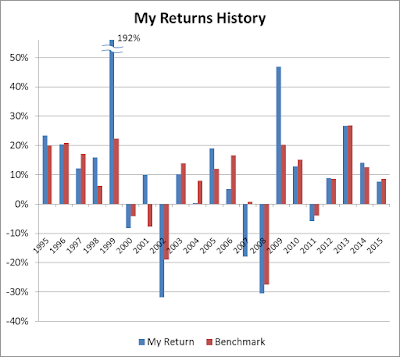 An example would be those who caution that the next decade’s stock returns could be lower than past returns. However, there are many more people who make projections to further some end of theirs; these people seek to mislead rather than inform. Mainly they mislead by giving the impression that they can predict the future. There are a great many brilliant people who have devoted their working lives to studying the same information T.S. was examining. Stock prices reflect a consensus view of the future. They already take into account all the information available today. This stock price consensus may be flawed sometimes, but I can’t divine the future better than so many brilliant people, so I don’t try. The consequences of this conclusion are powerful. I’ve decided that spending my time studying stock prices or any other macroeconomic data is useless. After poring through all the information T.S. was studying, I have no better idea of what will happen to stocks than if I had taken a nap. T.S also mentioned the current scary-looking conditions of “economic head winds, declining consumer disposable income, market distortions from the central banks and governments, and the current market valuations.” Things always look scary as you live through them. Only in hindsight do we get the illusion of certainty. If you wait for certainty, you’ll be waiting forever. I’ve chosen an asset allocation and have decided how I will change it after I retire. I stick with this plan regardless of what happens to stocks. I make no tactical moves in response to recent market movements. I prefer “recent market movements” to the phrase “current market conditions” because the latter gives the illusion that what has happened in the recent past will persist into the near future. So, if I were just starting out investing today, I’d begin by choosing an asset allocation based on the long-term returns history of stocks, bonds, real estate, and cash. Then I’d begin investing a fraction of my pay each month based on this allocation, keeping costs as low as possible. If I were starting with a large sum of cash, I’d consider dollar-cost averaging into my investments. I might choose to invest it all at once today, but if I was worried about investing at an unusually bad time, I might invest 10% every couple of months for the next year and a half. 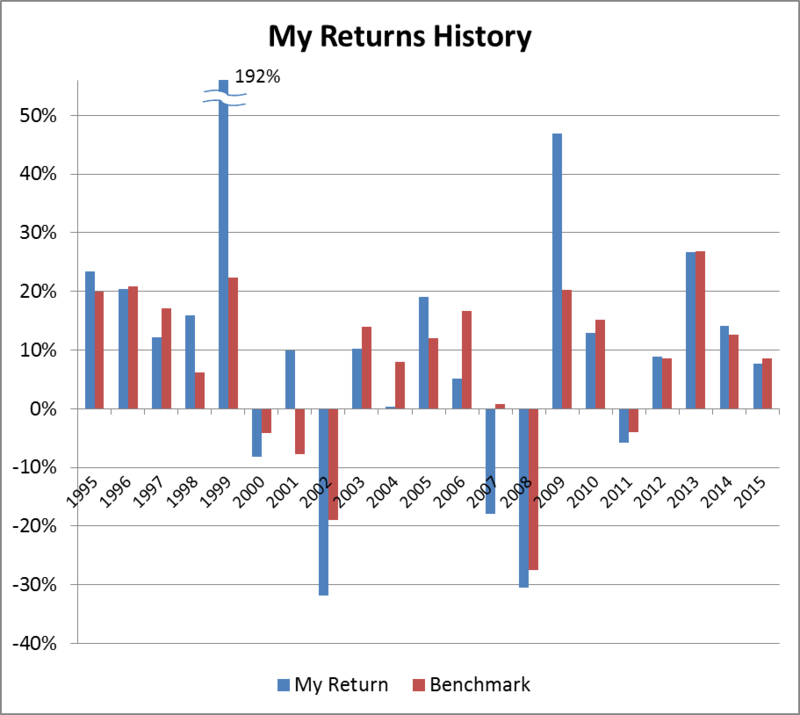 Investing it all right away gives higher expected return, but easing into the market reduces risk. However, my decision of whether to invest all at once or to ease into the market would not be based on “current market conditions.” I don’t believe I have any useful insight into what will happen with stocks over the next day, week, month, or year. I’m just hoping the past trend of stock indexes giving positive returns during almost all decades will continue. So there you have it. Investing has become quite easy for me now that I’ve let go of my illusion that I might be able to see the future. My son tells me that he’s been inundated with ads for phone applications to do binary option trading. His gut tells him that this is “incredibly dangerous” and looks to him like “making a game out of day trading that you can play on your phone.” He’s got a smart gut. Don’t be intimidated by the phrase “binary option trading”—it just means gambling on stocks. Want to bet that Google stock will go up in the next hour? You can do that with binary options. It doesn’t matter how much the stock goes up. You either lose your bet, or you get it back along with some pre-set amount of winnings. It’s very similar to gambling on sports. I poked around a few binary options web sites and they feel surprisingly similar to gambling and poker web sites. They use words like “investing” and “trading” but they’re really promoting gambling. What’s the purpose of binary options, you may ask? Let’s start with regular stock options. One purpose of regular stock options is to control investment risk. Sophisticated investors who understand stock options well can use them to customize the overall risk levels of their portfolios. Less sophisticated investors (almost everyone) who use stock options are just gambling in ways they don’t really understand. Binary options take away the potential risk-management properties of regular options and leave just the gambling part. Just in case you’re thinking that you might like to try binary options because you know more than your neighbours about stocks, don’t bother. You’ll never be betting against your neighbours. You’ll be betting against sophisticated sharks who will pick your bones clean. So, if you have excess money that you need to get rid of, you can give binary options a go. But, before you do, please send me half the money—the binary options people can have the other half. I’m not greedy. We will get the content written. The content will be of excellent quality and will fit the topic/nature of your site. The article is not marked as sponsored and will stay on the site permanently even if it rolls over into the archives. The sender wants to place an ad on my blog disguised as an actual article. I wouldn’t have to write anything and I get to name a price. The purpose of the placed article would be to improve the target site’s Google PageRank (that’s what the “do-follow” means) and to steer traffic to the site. Another condition is that I cannot alert my readers that the article is “sponsored,” which seems like lying to me. I find the promise that the “content” will be of “excellent quality” amusing. People who think of articles as “content” are similar to the people in the book-publishing business who think of books as white bricks. I’m quite confident that the article would be grammatically correct and written well enough that my readers would have to waste some time figuring out that the article was drivel. I won’t say I don’t have a price because that’s obviously not true. A million dollars would certainly do it. Fortunately for the quality of my blog, the amount I’d be willing to accept is orders of magnitude higher than the amount they’re willing to pay. Another minor reason this stuff is easy for me to ignore is that I’ve had nothing but trouble with Paypal. Every time I try to pay for something they block the payment until I re-verify my account in some new way. I still have a few hundred dollars in a PayPal account that I can only spend in payments of less than $70 at a time. So, if I won’t take sponsored articles, why do I write this blog? It’s not exactly altruism. I do like helping people, but I also like a chance to express my opinions. The main thing that I’ve got out of this blog is that I now know how to invest my money for very low cost in terms of both dollars and time. Through a combination of my efforts and useful feedback from readers I now know how to pay rock-bottom fees and don’t have to pay much attention to my investments. Freakonomics has a fascinating podcast on the pay equity gap between men and women. Claudia Goldin, a professor of economics at Harvard University, explains research showing that the gap exists mainly because men and women make different choices in their careers. Popular explanations such as discrimination and pay negotiation are minor factors at most. Scott Adams briefly describes the situations where he would recommend an active money manager. Don’t drink anything while reading this one. I just about shot water through my nose. Big Cajun Man reports that TD has added a new $75 fee to transfer money to a TFSA at another financial institution. If I banked at TD, that would definitely be a one-way transfer. The Blunt Bean Counter describes various reactions among his clients to the higher marginal tax rate for high incomes in Canada. His clients seem even more concerned about potential changes to the small business deduction. Potato has a decision guide for when to use a TFSA or RRSP. There are a number of individual factors that enter into this decision and Potato does a good job of simplifying the decision process. Robb at Boomer and Echo digs into his portfolio performance for 2015. In it he mentions that his return target is 8% per year before inflation. I prefer to choose an after-inflation target. What matters to me is purchasing power, not number of dollars. This has the added advantage that I don’t have to guess both inflation and my portfolio’s nominal return. Canadian Couch Potato reports the returns for his various model portfolios. My Own Advisor plans to kick three investing habits. But make sure you know what he means by each one. For example, he plans to “stop focusing on portfolio return,” but that doesn’t mean he’s going to keep all his money in GICs. Million Dollar Journey looks at how dividends are taxed differently in each province. When I first heard that Gail Vaz-Oxlade’s newest book was called Money Talks, I misunderstood the theme as “money talks and BS walks.” But the book’s focus is making a strong case for talking about money. Gail covers just about every imaginable way that people can have trouble with money and offers specific help for each case. I couldn’t put it down. As someone with strong finances and good habits, I often find the self-defeating actions of others puzzling. “Stop spending stupidly” makes perfect sense to me, but is completely unhelpful for most others. In this book, Gail tells dozens of small stories to illustrate different causes for financial troubles. I’ve found them to be very helpful in understanding the many ways people mess up their finances. Because financial troubles usually have an emotional basis, much of the value in Gail’s scenarios is that she gets the emotional parts right. Then to go with each theme of financial woes she gives a prescription for how to help yourself or others. It’s clear these detailed prescriptions are drawn from her extensive experience in finding ways to get people to make positive changes in their financial lives. And again, in her prescriptions, she gets the emotional parts right. The majority of the book deals with overspending, but there is even a section about tightwads. As with other types of financial dysfunction, Gail offers several steps to get tightwads to view their finances more realistically and understand that it’s okay to spend a little if you’ve got the money. In one section on family finances, Gail stresses the importance of each spouse getting “an account in their own name.” As it happens, I have an elderly aunt who can’t even get a credit card because her recently deceased husband had all the credit in his own name. In another good quote, Gail says “People have an amazing ability to believe with all their heart that the things they wish were true can become true.” This can be a good thing when it leads to hard work, but not so good if it makes us believe that debt will somehow disappear on its own. Back when I worked for a high-tech start-up, I was amazed at how many employees never exercised any of their stock options. I chalked it up to a combination of overconfidence, all-or-nothing thinking, and a misguided sense that selling showed disloyalty to the company. Gail has another explanation from some Stanford research: “investors’ biggest fear was not the loss of their money but the likelihood that they would do worse than their peers.” So, maybe my colleagues feared selling and then watching peers keep making more money as the stock continued climbing. Of course, the end result was a big crash. When it comes to those who fail to make changes in their lives out of fear, Gail suggests a gentle touch. “You can encourage them to figure out what they’re afraid of—really afraid of—and find ways to work through that fear. Sometimes all a body needs to step into the breach is some encouragement and the knowledge that someone is there to hold their hand.” A book she recommends for such people is Feel the Fear ... and Do It Anyway by Susan Jeffers. Gail explains why debt is a bigger problem today than it was in the past: “Once upon a time people were limited in how impulsively they could spend, because their money would run out.” Access to the various forms of credit we have today has changed things dramatically. I wouldn’t have thought it possible to isolate your finances from a recklessly spending spouse, but Gail offers a set of 7 steps to do just that. In one of the steps she recommends putting the most important bills in your own name and letting the free-spender cover “cable, telephone, sports fees, et cetera.” It’s no fun to have the phone cut off, but it’s better than losing the heat in winter. It’s clear than Gail’s main motivation is to help people. I recommend this book to anyone who wants to learn effective ways to help those who don’t handle money well. I had a couple of people I know in mind as I read this book and several parts were directly on point. I suspect most readers with particular problems in mind would also find some relevant advice. Every so often I encounter a simple financial question that makes me cringe. It’s not that the asker is a bad person or that the question is stupid. It’s just that the question gives me a peek into a financial world that looks scary to me. I like to help people, but sometimes it’s hard to know where to start. Here’s the list of questions (edited for brevity) that I’ve collected so far. 1. Does a mortgage count as debt? Uh, yes. And consolidating your debt into your mortgage doesn’t count as paying off your debt. Don’t fall into the trap of thinking that a mortgage is good debt. The house is good and the mortgage is bad. Most other types of debt are even worse than a mortgage. 2. Do I need an emergency fund if there is still room left on my line of credit? Yes. Don’t think of room on your line of credit as available wealth to spend. One of your goals should be to pay off your line of credit and live debt-free. Emergencies shouldn’t throw you into more debt if you can avoid it. 3. How many credit cards is it safe to have? For some people the answer is zero. For those who pay off their credit cards in full every month, it’s a good idea to have two cards in case one is mistakenly refused at an inconvenient time. Having many cards and using one to pay off others is just a gateway drug to payday loans and ultimately bankruptcy. 4. Should I get a loan to buy an RRSP? Probably not. Borrowing for an RRSP contribution is rarely a good idea, particularly for those who think RRSPs are something we buy (they are just accounts that hold the investments we buy). Learn to spend less than you make. Once you have some excess income, open a TFSA or RRSP account to save and invest this money. 5. How did my trade-in make my new car’s payments higher? You owed more on your trade-in than it was worth and the excess debt got thrown onto your new car. Going further and further into debt for cars is stupid. Until you can buy a car outright for cash, consider not owning a car or getting the cheapest car that will meet your needs (not your wants). 6. Why does my pay sometimes go into my account 2 hours later than normal? I don’t know, but it shouldn’t matter. Maybe you like to monitor all things related to your money very closely. You’re entitled to spend your time as you see fit. But if you know when the money hits your account because you’re living hand-to-mouth, consider trying to save up a small cash buffer. My short answers are unlikely to fully address the needs of those who ask these questions. I try, but Gail Vaz-Oxlade would certainly be much better able to help. 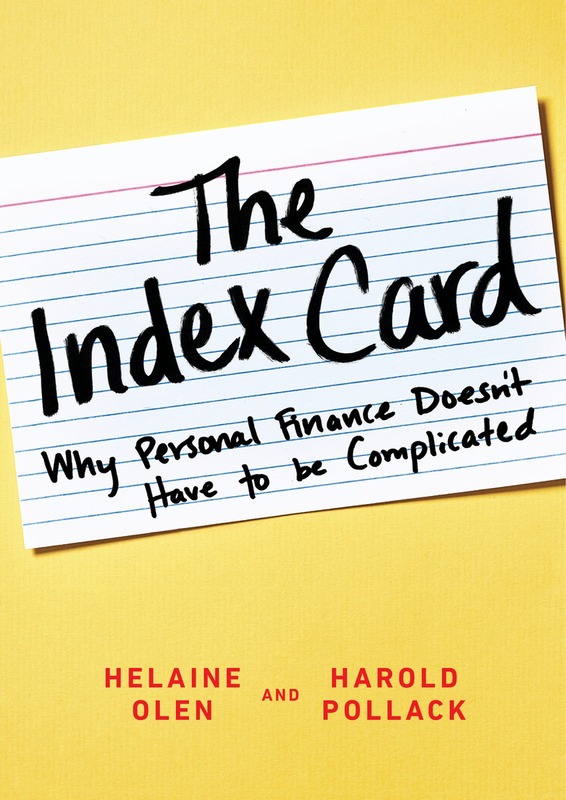 Is good personal finance advice so simple that it can fit on a single index card? Sort of, but not really. 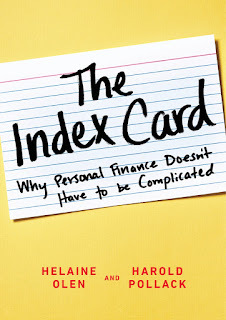 That’s why Helaine Olen and Harold Pollack had to write the book The Index Card to explain a list of 10 rules of personal finance created by Pollack. This book lays out a series of simple steps for managing our money that steer us away from the unnecessary complexity that gets marketed to us. Each chapter of the book explains one of the 10 points on Pollack’s index card. Some are standard fare, such as “Strive to Save 10 to 20 Percent of Your Income,” but others may surprise readers, such as “Never Buy or Sell Individual Stocks.” This book is aimed at Americans with its discussions of 401(k) plans, health insurance, and tax breaks for mortgages, but most of the advice carries over well to Canada. These authors don’t pander to readers who want to believe nonsense about how life is harder today than it was years ago, but they do make a good point about debt. One “secret to our grandparents’ extraordinary financial discipline was a ... lack of access to credit.” The marketing of debt is one way that managing personal finances today is harder than it was many decades ago. Of course, there are many reasons why managing money today is much easier than it used to be. For example, almost everything is much cheaper relative to our incomes. The sixth rule is “Make Your Advisor Commit to the Fiduciary Standard.” This makes a lot of sense to me, but would be tough to execute for modest portfolios. It would be best if all financial advisors had to meet a fiduciary standard. This would cut out the bulk of the poor financial advice choices and make it easier for people to find the remaining good choices. “Experts recommend spending no more than a third of your take-home pay on housing.” This sounds too high if it only counts a mortgage. But if we toss in property taxes, home insurance, and repairs, it may be a little low. This type of advice needs more explanation that the authors don’t provide. I had to laugh at a dig at the insurance industry: “where there is fear and there are commission-based salespeople, there will be people looking to exploit and profit from that fear.” Another good bit in the insurance section is “Go for the high-deductible option.” I wouldn’t even make a claim for less than $1000, so having a deductible below $1000 makes no sense. One piece of insurance advice I couldn’t understand is “Adequate liability coverage is at least twice your net worth.” This makes no sense to me. It’s the amount of the judgement that matters, not what you own. If I get sued for $2 million, I want to be covered for $2 million. If my net worth is $600k and I follow this advice, I’ll be covered for only $1.2M and would be on the hook for the remaining $800k. I’d be wiped out. One bit of pandering was to women, mothers in particular. Some salary survey says that a mom “often provides services worth more than $100,000 a year if you actually needed to purchase these services.” Sure. And all the little odd jobs dads do would cost the same if you called someone into the house every day to do them. So what? All the contributions people make to their families are valuable, but putting an inflated dollar figure on them is pointless. Overall, there was a lot to like about this book and the problems were very minor. Personal finance needs to be simple. But much of the messages marketed to us advocate complexity. The index card rules are a sensible antidote. I’ve never been much for setting New Year’s resolutions for myself – I tend to make changes on my own schedule. But if making resolutions works for you, then that’s great. The Findependence Hub published a list of financial resolutions that are very sensible. What surprised me was how they all missed the mark for my circumstances. 1. I resolve to figure out my finances. I did this years ago. They seem quite figured out. Maybe I’ll learn new things around the edges, but I can’t think of anything major that needs figuring out. One thing I’ll need to sort out sometime is how to minimize taxes as I draw down my various accounts in retirement, but that’s hardly the intent behind this resolution. 2. I resolve to stick to a budget. Nope. I refuse. My finances are ticking along wonderfully without ever having created a budget. I fully realize that most people would benefit from budgeting. I’d venture that even most people who think they don’t need to budget are probably wrong. But I don’t seem to need one. 3. I resolve to get out of debt. Done long ago and it feels great. 4. I resolve to save more. Nope. I already save more than half of my take-home pay. I don’t need to save any more, thank you. 5. I resolve to stop wasting money. Nope. What little wasting of money I do now fits very comfortably into my finances. So, I’ll keeping eating out, taking my sons golfing, and all the other wasteful things I do with my money. So there you have it. I serve as a terrible example for the vast majority of people who need to follow most of these resolutions. I’ve even provided defiant refusals that fit my life and shouldn’t be adopted by others. Sorry. Gail Vaz-Oxlade takes a couple of people to task for their claims that Canadians’ debts aren’t that big a deal (in a post no longer online). I’m with Gail on this one. In the past I’ve explained why all debt is bad and have explained my personal philosophy on debt. Andrew Hallam explains why stop-loss orders can be a bad idea for ETF investors. Big Cajun Man walks away from Rogers to save about $100 per month. My Own Advisor evaluates how he did on his financial goals. Three out of four ain’t bad. But it’s the dollar amounts that matter. How well he did hinges on how much added debt he took on, but I’m guessing that’s small if he plans to eliminate it in only four months. Boomer and Echo takes a look at how much money you need to retire. As I’ve explained before, it depends greatly on how much money you want to spend.